On March 3rd, City of Asylum/Pittsburgh conducted what was possibly its most unique event to date. That Tuesday night, those in attendance at 330 Sampsonia Way were treated to a reading of material from Burmese writer-in-residence Khet Mar, whose stories and poems were presented in Burmese, English, and Spanish! Khet Mar read the English translation of her “Prison Story” (forthcoming in Carpe Articulum). Translator Michelle Gil-Montero followed, reading an English version of another Khet Mar story which was translated by her St. Vincent College creative writing class with Khet Mar’s participation. Khet Mar also read several of her poems in their original Burmese, with Gil-Montero following in English, and Argentine poet and translator Román Antopolsky reading his Spanish translation of the same work. You can watch an excerpt of the multicultural evening–Khet Mar’s poem “Melancholy” read in Burmese, English, and Spanish–above. Listen carefully; each translation of the poem has its own pacing and characteristics, yet all of the works remain linked through their content and origin, like a family of voices speaking together. KHET MAR (Burma, City of Asylum/Pittsburgh) is a journalist, novelist, fiction writer and essayist from Burma. Author of one novel, Wild Snowy Night (1995), as well as several collections of short stories, essays and poems, her work has been translated into English and Japanese, broadcast on radio and made into a film. 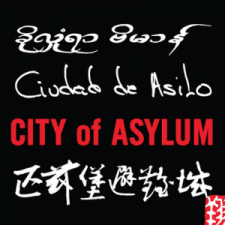 Khet Mar is the current exiled writer-in-residence in City of Asylum/Pittsburgh. She has written the text and her husband, the visual artist Than Htay, created the new artwork on the façade of 324 Sampsonia Way. Khet Mar is one of a group of international writers who will be traveling to Gettysburg, New Orleans, the Gulf Coast, Birmingham, and Baltimore, to examine the different challenges presented by historical crises and upheaval. The program is sponsored by the State Department. The writers were selected by the International Writing Program of the University of Iowa. Khet Mar will be blogging during her travel in Burmese and English on sampsoniaway.org. Read a recent Pittsburgh Post Gazette article on Khet Mar and her new life in Pittsburgh’s North Side as writer-in-residence at City of Asylum/Pittsburgh. MICHELLE GIL-MONTERO has an M.F.A. in Poetry from The University of Iowa and B.A. in English from Brown University. Her translation of Poetry After the Invention of América: Don’t Light the Flower by Andrés Ajens is forthcoming from Palgrave Macmillan in 2011. Her translations have appeared in The Oxford Book of Latin American Poetry, as well as in journals including Beloit Poetry Journal, Jacket, Conjunctions, Words Without Borders, Circumference, and others. Her poems have appeared recently in Colorado Review, Third Coast, Cincinnati Review, and others. She lives in Pittsburgh and teaches English at Saint Vincent College. ROMAN ANTOPOLSKY was born in Buenos Aires in 1976. His books of poetry include ádelon (Tsé-Tsé, Buenos Aires, 2003), Cythna en red (Intemperie, Santiango de Chile, 2008), and Amor Islam (Lumme Editor, São Paulo, 2011). His translation into Spanish of Lyotard’s Discours, Figure is forthcoming in 2011. He has published translations from Russian, German, English, French, and Portuguese. He lives in Pittsburgh and read his poetry in Jazz Poetry 2008 “What is Home?” performance. 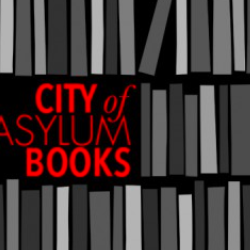 Note: City of Asylum/Pittsburgh’s next reading is on May 3rd, when 330 Sampsonia Way opens its doors for the PEN World Voices Festival, featuring: Hervé Le Tellier (France), David Bezmozgis (Latvia/Canada), and Kyung-sook Shin (South Korea). Check the Pittsburgh Literary Calendar for more details.